Why an Ultraspin Oily Water Separator? 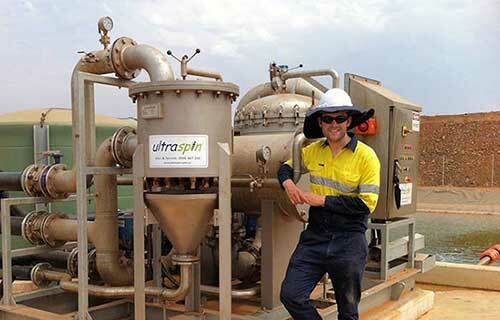 How does the Ultraspin Oily Water Separator work? 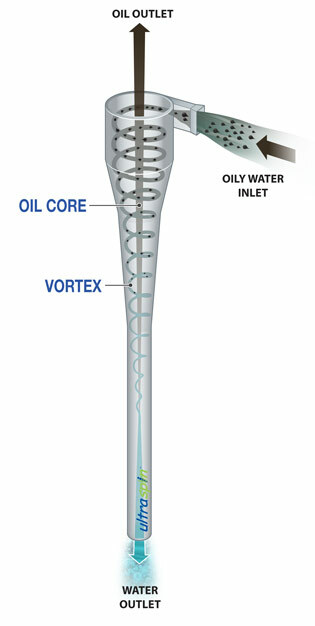 A spinning vortex is created by pumping the oily water tangentially into a cone-shaped separator. This creates a powerful centrifugal force, that accelerates as it moves down the cone. These strong forces separate the heavier water component to the outside of the vortex while the lighter oil droplets are forced to the centre. 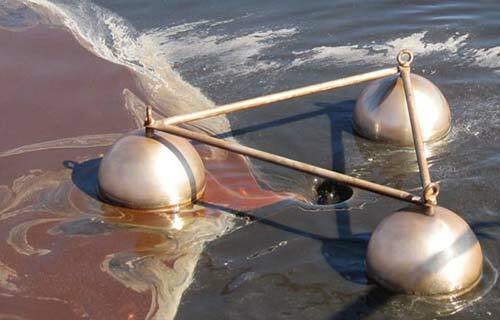 The separated oils are removed through an orifice at the inlet end of the cone and treated water is discharged through the opposite end. 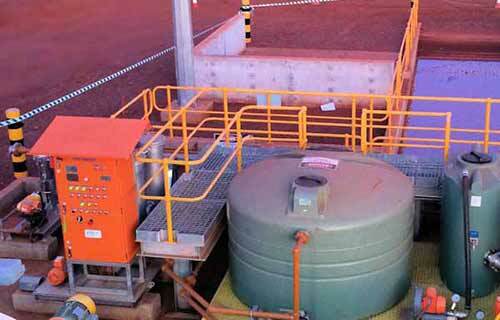 Why is it such a powerful oil water separator? The centrifugal force generated inside the vortex of the Ultraspin oil separator is in the order of 1,000 times the force of gravity! 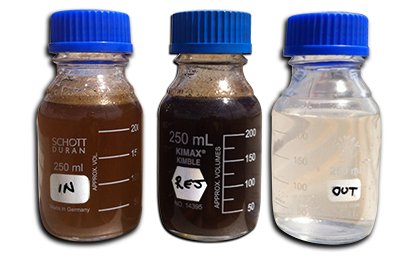 With such force, effective oily wastewater treatment can be achieved even with emulsified oil droplets below 15 microns. 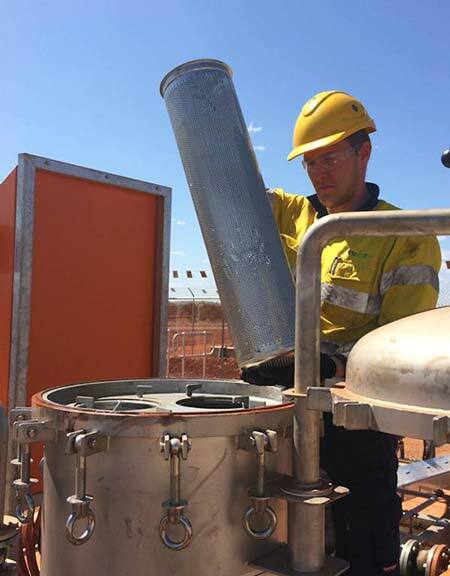 Other traditional oil water separators, like coalescing plate packs, petrol interceptors, tanks or similar, depend on weak gravity or coalescence forces for oil separation and consequently are less efficient. Give us a call on (61) 3 8841 7200 or send through an email to get started on a conversation to begin solving your oily water separation problems. With an Ultraspin separator you get high performance with a reliable, low risk system that requires very little maintenance. 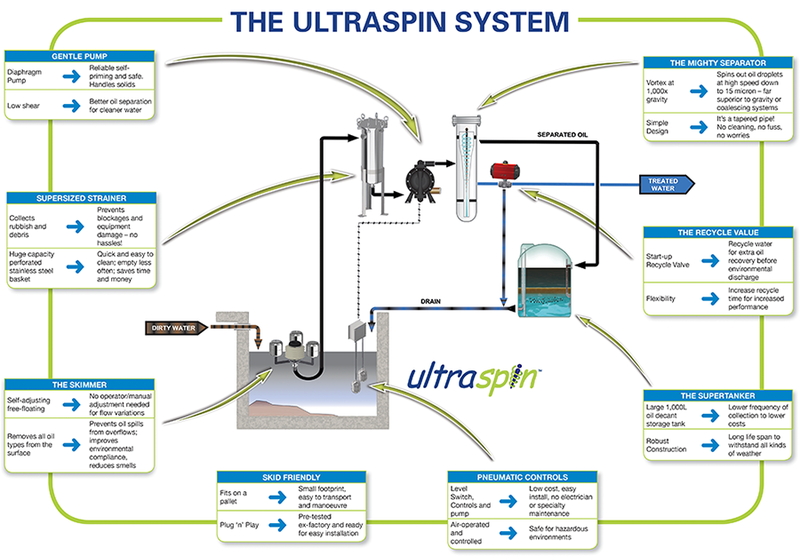 This is achieved because with Ultraspin you get a complete system that includes large strainers, oil skimmers, large oil storage decant tanks and control equipment as standard; no surprises and you know exactly what your costs will be. 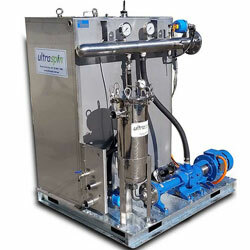 The Ultraspin oil skimmers is an important part of many of our oil water separators. Why do we like them so much? Our system include very large, high capacity easy clean strainers. 30 years experience tells us a strainer is essential for protecting the pump and other equipment from wear and damage. All kinds of debris collects in an oily water pits; leaves and twigs, cigarette butts, feathers, food packets, cable ties, even beetles and other insects! Our customers really like our large strainers – its a great advantage of our systems. 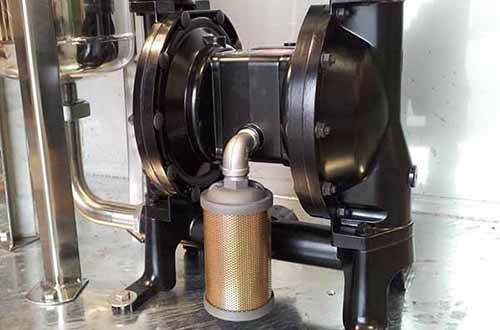 Particularly as most competitor oil water separator systems do not come with a strainer at all, meaning their equipment gets damaged quickly – forcing downtime and requiring costly spare parts. Ultraspin designs feature large oil storage tanks. 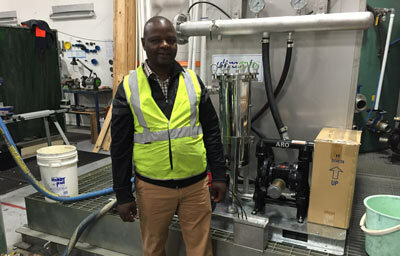 The objective of an oil water separator is to remove oil – and lots of it. Many of our competitors don’t supply an oil tank, and when they do, its tiny! The Ultraspin separator is powerful, separating lots of oil , and larger tank gives you the convenience of emptying it less often, and no more constantly checking to see if it’s over-flowing. In addition we fit our oil tanks with an automatic water drain. Separated oil from oily water treatment systems of all types always contains a large percentage of water in addition to the recovered oil. This is true for every oily water separator technology on the market. Decanting this water will save you a lot of money in waste disposal fees. Our strategy to treat dissolved oils is our simple Aeration Tank. It works by injecting large volumes of fresh air into a tank. The bubbles remove dissolved hydrocarbons and other contaminants in the water. Extended aeration allows time for natural aerobic bacteria to consume the emulsified oil as well as detergents and other chemicals. 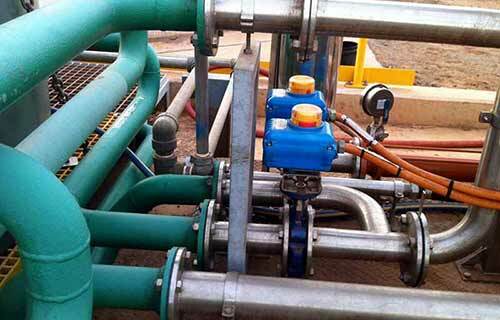 Pumps are a very important part of an oil water separator and we are very fussy about pump selection. A poor pump can be very detrimental to the performance of an oil water separator. By using our oil droplet particle sizer we quickly identify pumps that ‘shear’ or chop up the oil droplets, emulsifying the oily water, and making separation more difficult. Most vendors don’t have equipment to measure oil droplet particle size and therefore often select pumps purely on cost. This results in poor oil water separator performance and a costly mistake for their customers. 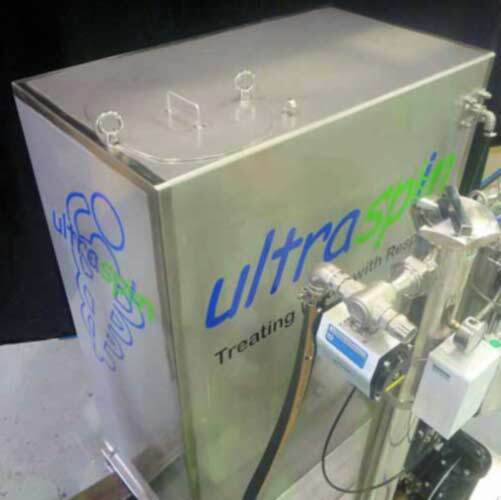 At Ultraspin we design, select and performance test (with one of our oil droplet size tools) all our pumps to make sure that they are gentle on the oily water and give the very best possible oil water discharge quality. Its one of the many reasons our systems work so well. With this philosophy we are able to offer pneumatic and electric pumps to suit your application. Different materials are also available to suit the application. Start up Recycle: Allows the removal of thick oil layers before treated and discharging water; Multiple treatment of water to increase overall oil separation efficiency when oil droplets are very small or higher water quality discharge is required. Backflush: On sites with higher trash loads we often include timed / automatic back-flushing. The single most important factor when choosing an oil water separator is oil droplet size. Your oil droplet size determines which oil water separator technology types will work for your application, and which will not work! Follow this link to learn more. 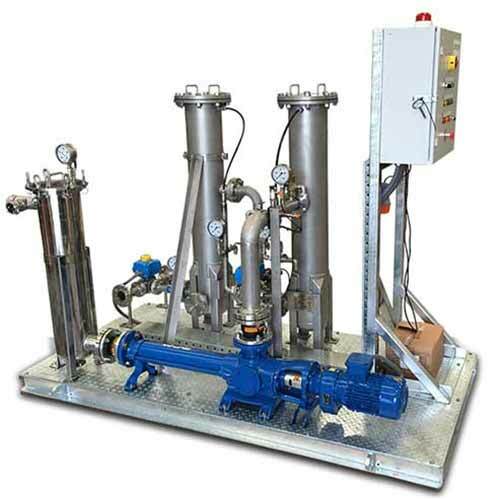 There are many oil water separator technologies on the market with different methods of separation. It can get confusing. Follow this link to help understand the many different technologies available. Spend wisely! We help you uncover the hidden costs for running different oily water separator types. From cleaning costs, site access and excavation costs, crane hire, to fire proofing, engineering fees – find out what most suppliers won’t tell you! If you’re not an oily water expert don’t worry. In our Learning Centre we have put together a wealth of information that will turn you into an expert in no time! Want to compare different Oil Water Separation technologies? Are you confused by the capabilities of Coalescing Plate Separators, VGS, European ‘5 mg/l’ tanks, DAF’s, Media filters or centrifuges? We can provide some information to help you decide. The single most important thing when selecting an oil water separator is knowing its oil droplet size micron rating. Large droplets are easy to separate and most separators will do that, but if your oily water mixture contains smaller oil droplets you will need a more powerful separator with a lower micron rating. 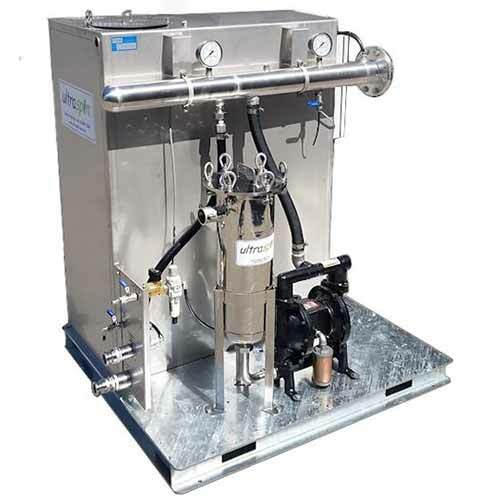 We have a range of oil water separator options that cater for most oily water applications. Follow the links below for further information.